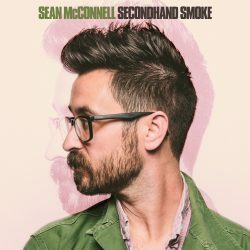 It is probably too early in the year to think about what your album of the year is, but it would be safe to say that Sean McConnell’s new album ‘Secondhand Smoke’ will probably end up at the top of the list. The thirteen track album is pretty basic in terms of its production, everything recorded by him- minus the synths and strings. It has an authentic homegrown feel to the album which is nicely reflected in the fact he recorded it in his home. ‘Shaky Bridges’ is an amazing track, highlighting the issues with perfections and black and white choices. With the gospel harmonies of The McCray Sisters, it makes a slightly haunting song so beautiful to listen to. The closing lyric “you could buy the world for the price of your soul” before the song fades has a spinetingling feeling to it which made me play the song on repeat again and again. Quite a few of the tracks on the album have strong biblical roots and messages, but with McConnell being from the South it is not surprising that religion has influenced his music. ‘I Could Have Been An Angel’ is a broody reimagining of Jesus and the Devil spending forty days together, where Satan looks at his promising beginning being shattered. McConnell’s vocals help strengthen the sad message behind the song that our circumstances can affect our outcome. The chorus spoken from the point of Satan really highlights this point: “I was a baby just like you, I had a soul shiny new,” showed that anyone has the potential to go either way good (angel) or bad (devil) regardless of how they started out. One of the worst things I personally feel about seeing an artist live is that it can ruin the album for you when you listen to the studio version again, but that is not the case with Sean McConnell. After seeing his set at Celtic Connections, his vocal talents were amazing, but it is the same quality you get on the album, which is something which does not always happen. It is hard to find a fault with this album. Sean McConnell is a stellar storyteller with his lyrics and his music. This album should be on everyone’s radar. He is the definition of a talented folk singer.